Here is what we find looking at the numbers for early voting as of Tuesday, October 30 – one week before the election. Numbers include in person and absentee voting. 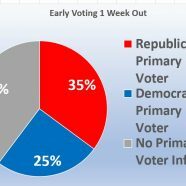 Since we cannot determine party affiliation from the votes in the General Election, we go back and match those that have voted with how they voted in the 2016 and 2018 Primary election, where voters are asked whether they want a Republican or Democratic ballot. We can assume then that they will vote the same party in the General election. Republican voters are turning out in larger numbers than Democrats. But notice that 40% of the voters have no record of voting in a primary. 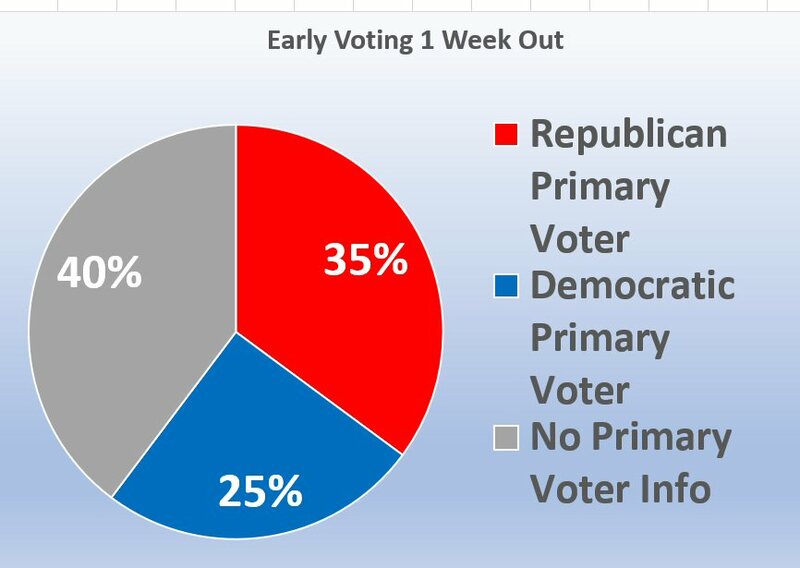 These are either new voters since the Primary or voters who have not voted consistently in the Primary elections. Either way, it is a large group of unknown. We can combine this voter data with some other data that we have and determine some interesting facts. For instance, in the graph on the left, the total number of Democratic Primary voters is 410,130. If we select Democratic Voters AND African-American voters we come up with 582,610 who have voted early. Since we got the additional 172,480 voters by adding in just the African-American vote we can assume that, while certainly a large number of them voted Democrat, the increase in the count are part of that 40% of voters that don’t have a party affiliation. If my logic is correct, then blacks make up about 27% of the ‘unknown’ voter pool. 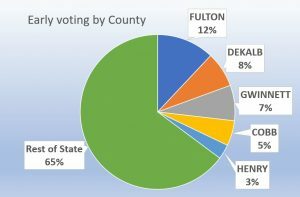 According to the 2010 census, blacks account for just over 31% of Georgia’s population. Notice that 65% of the votes are coming from outside the Metro Atlanta area, which should be good for Republicans, who are expected to do very poorly in the metro counties. and select the latest date to bring up the files.